Ho, Ho, Ho! Where’s the V.O.? The gifts are wrapped. The tinsel is strung. The Brussels sprouts are creamed, and the ugly sweater collected from the cleaner. Let the holiday festivities commence! But something is always missing for me at this time of year. Even if I’ve only ever technically worked in an office for one short period of my life, I miss the office holiday party most. Like many people living with chronic illness generally and multiple sclerosis (MS) specifically, I’ve had to first cut back and then end my former working life. Sure, I’ve found new things to fill my time, to make ends meet, and to make me feel of some worth to society, but I miss working with people and then celebrating with them. Be it a swanky gathering at a glitzy venue or a simple potluck lunch in the break room, the chance to make merry with the people with whom I’ve worked was a time I cherished. To sit down for a meal or chat around a punch bowl and not talk about work was a nice thing. I learned about new foods and other peoples’ traditions, took home ideas, and made friends out of colleagues. All of this for a few pounds out of old Mr. Fezziwig’s purse or out of our own, in other cases. 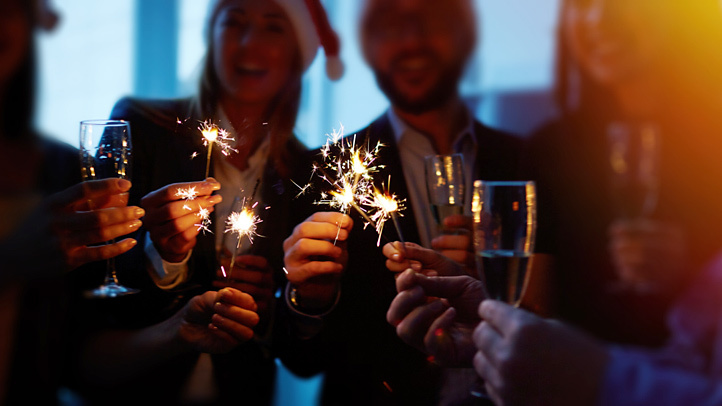 Just like the Dickens character Scrooge, from A Christmas Carol, I, too, look back at the office parties of my younger days with joy and melancholy. Of course, to be able to dance again would be nice. But it is the camaraderie of old workmates and bosses, the collective sense of satisfaction in celebrating a job well done, and the time when personal and professional nearly touch that I miss more. To laugh with an admiral, or coo at snapshots of an assistant’s children, or shake the hand of someone working through his own difficulties; to not be supervisor or supervised, but to be happy humans together … that’s what I miss. I don’t dwell on such things. In fact I don’t think of them much at all, relatively speaking. But at this time of year, it’s one of the glaring things that are missing from this new life with MS. A life without so many things (and also a life with so many great things), but this time of year, this one sticks to me. This blog has become something of my “job,” I suppose. Creating the Life With Multiple Sclerosis community has been important work that all of us can take great joy in seeing as an achievement. I’d love to sit down to a bowl of gin punch with each of you and raise a glass to the season and all the joy that is in it, as well as to your joint success in making this the community it has become. So, in wishing you all the happiest of Christmases, I want to also thank you for the time, effort, and emotion you’ve all been willing to give to this thing we have all created … together.